I played with eduCanon for the first time today. 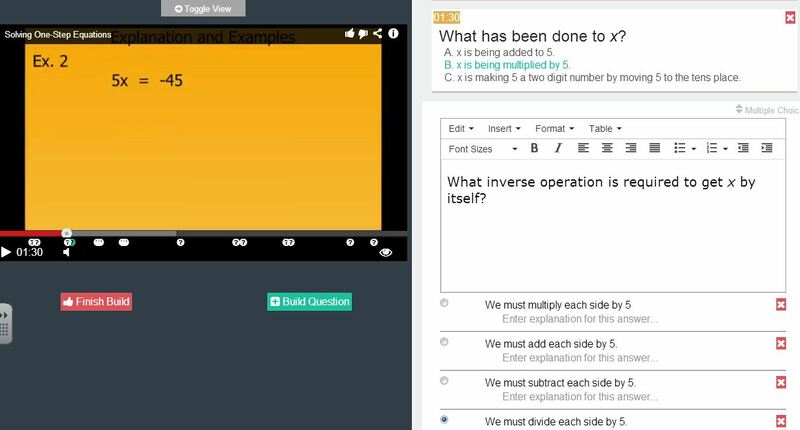 The webtool allows you to take a screencast that has been uploaded to YouTube or Vimeo and insert multiple choice questions to create a flipped or blended learning lesson. Update: This is the remix of Karl Fisch‘s one step equations video. He does a terrific job explaining the concept. Originally I had thought to keep the remix private, but I think crowd sourcing for feedback on how this tool can improve learning is important. Here’s a screenshot when in the editor mode. The ? above the timeline indicates where questions have been inserted. I spent more than an hour thinking up about 15 questions and multiple choice distractors. And that doesn’t include the time creating the video. Look. I’m “complaining” and I didn’t even make the screencast! And here’s a screenshot of the students’ view when watching the lesson. The product is incredibly worthwhile. On the other hand it can be incredibly time consuming. It’s easy to use, a downside is the question editor doesn’t automatically position the question next to the video. You have to scroll down to line them up. Before you know it, you’ve spent several hours polishing a short video. I’ll be interested in learning how long the product will remain free to content creators. Hi there! Glad you enjoyed eduCanon. I’m with the company and wanted to answer your question about how long it will remain free. We are committed to keeping everything you see on the site – including the ability to embed multiple choice questions into the YouTube/Vimeo of your choosing, assign it to your students, and get a question-by-question breakdown of student performance – 100 % free. To enhance our current suite of offerings, we are releasing some premium features which include gradebook export, free response question types, and a lesson search giving you access to the reservoir of high-quality lessons (already thousands!) created by our userbase. The lesson download gives you an excel spreadsheet of your student scores by lesson for easy integration with your existing gradebook.